Managing new and returning patients is now made effortless with hCue’s Clinic Management Software.Past patient details can be pulled out quickly by just knowing a single detail. It could be return number, patient id, return date, patient name, patient mobile, email id etc , your Clinic Management Software makes things as simple as that! 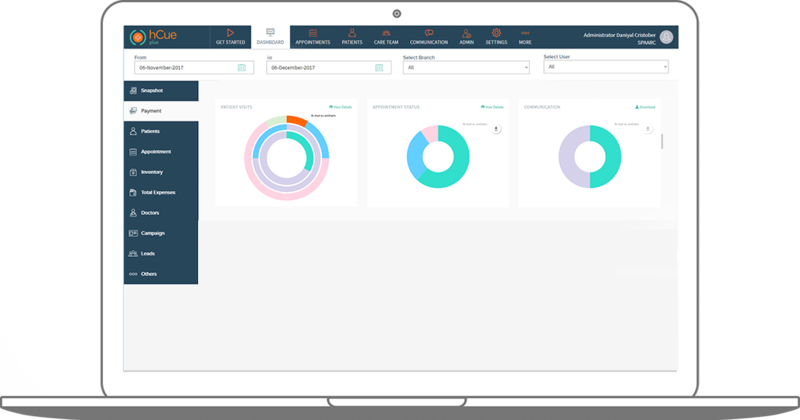 An ideal Clinic Management Software has to manage multiple clinics and perform multiple functions. Along with this, with hCue's Clinic Management Software as an admin you can monitor the access given to the users and enable/disable features based on your specific clinic requirements. You can always switch between your clinics inside the dashboard. 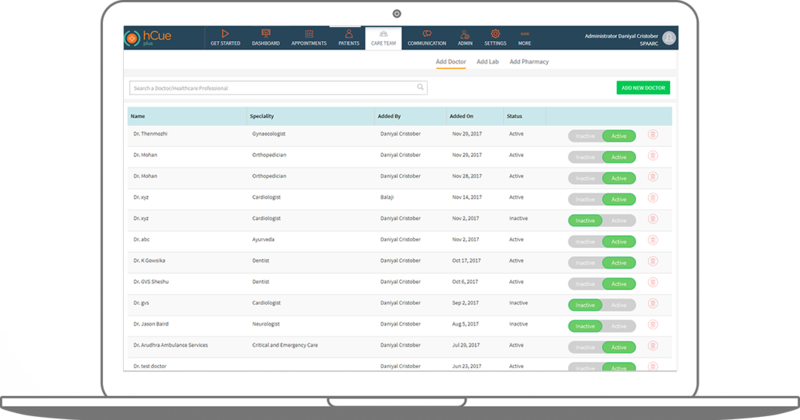 This gives you the comfort of accessing your Clinic Management Software as a one stop shop for management of multiple clinics. Can your Clinic Management Software get more easy and effortless to use? Get rid of your paper prescriptions & old clunky on-premise / non scalable software. 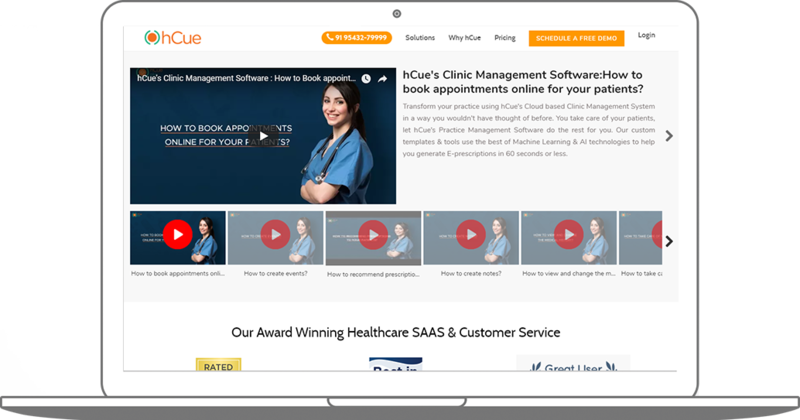 Transform your practice using hCue’s Cloud based Clinic Management Software. You take care of your patients, let hCue’s Clinic Management Software do the rest for you. Our custom templates & tools use the best of Machine Learning & AI technologies. Generate E-prescriptions in 60 seconds or less. Get More Control, Earn More Money! hCue's Clinic Management System handles end to end Revenue Management Cycle of your clinics. This way you can track your clinic’s daily revenues, inventory, receivables all at the click of a button. Ready to transform your clinic operations or do you still prefer working the old way? Speak to our experts on the best suited Dental Clinic Management Software for your Clinic, make timely decisions, handle patient information more effortlessly and also manage everything in a single interface. Unlike competitors, we don’t overdesign & over sell our Clinic Management Software. We keep our overheads low & pass on the accrued cost benefits directly to the customer. When every practice and specialization is unique, why should the EMR / EHR Software be the same? We have built a ready to use customizable software for every speciality. Dental, Ophthalmology or GP Software our speciality suite is growing fast. Put an end to your struggle of putting together bits & pieces of software from different vendors. Be it Clinic Management Software, EHR / EMR Software or Online Appointment Booking etc. With hCue’s integrated platform, the hardest thing you have to do is to unpack the box. Confused about the best Dental Clinic Management Software for your clinic? Reach out to our product specialists, share information about your requirements and get customised estimation on hCue's Dental Practice Management Software tailor made for your clinic needs..
Internet Can Go Offline, Your Clinic Need Not. hCue‘s Patient Management System comes with the industry first offline feature. Perform every clinical function seamlessly even if there is a disruption in internet services. hCue’s Clinic Management Software has been integrated with Tally Accounting. Scanned records, on premise software or niche players like Practo Clinic Management Software? Do not worry our proprietary data migration Mule tool makes data migration a breeze. Get your clinic up and running with hCue’s Clinic Management Software in no time.